Here’s an interesting theory that I have. The upcoming Diamer AG’s earnings report got me thinking about Chinese Yuan, metal, and dry bulk shipping. Last year, Diamer reported strong growth in the Chiense market. First of all we have the following information. Diamer as well as other auto manufacturers reported strong growth in the Chiense market in 2009. Chinese holdings of US treasury has gone down enough to make Japan the number one US treasury holding nation. If the Chinese goverment wants to keep the value of the yuan at similar levels, it is going to have to continue to spend the USD surplus by buying US treasuries. Given pressures withinin and outside the country, the country is most likely not going to intervene as much as it has in manipulating the value of the Yuan and as such, we might see further reduction in the US treasury holding in the next few years. China wants lower prices but the producers have no reason to; the producers see higher spot market prices. See here. Seaborne iron ore shipping rates are falling. Check out the Baltic Dry Index which measures the cost of dry bulk shipping of various items. 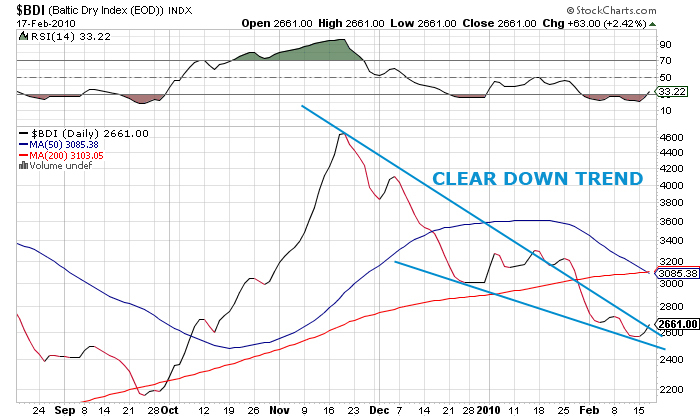 BDI is clearly in a downtrend. Daimler and many other auto manufacturers has built or are trying to build factories in China to meet the local demand. If so, they are going to have to import iron ores. If construction demand is waning in China, although it isn’t, the demand for more automotive might hold up the demand. Auto companies are probably going to produce more than what they’ve sold last year. With the bench mark iron ore price set near the spot market prices, the price of local iron ore prices will be high enough to give the Chinese to buy iron ore from the outside; the Yuan appreciating and the seabourne shipping rates dropping, it becomes cost effective to import and self produce. Given this theory, I think the iron producers in the US or in any other nation will do so well in the future. Also, if China wants to continue improving its infrasturcture such as roads and rail roads, it’s going to need more iron; iron is the building block of all infrastructure. Perhaps, this is something that William Furman, a chairman for more than 20 years, in Schnitzer Steel Industries Inc. (SCHN) has seen in the future giving him enough conviction to invest his own money of more than $3.6 million. Even if it’s not SCHN, I’m sure the whole steel industry sector will benefit in the upcoming future.